Among the participants of the meeting were Anna Mityanina and Igor Albin, Vice Governors of St. Petersburg; Vyacheslav Makarov, Chairman of St. Petersburg Legislative Assembly; Andrei Maksimov, Chairman of Science and Higher School Committee; members of the Board of Trustees of the Almazov Centre, including prominent figures from science, culture, education and heads of institutions that are members of the Translational Medicine cluster as well as other officials. One of the main issues on the agenda was the role of national projects in the development of health care and science in the Russian Federation. The implementation of Science and Health projects is a strategic plan for the development of science, education and health care for the next 5 years. It was noted that the Health national project will become a guideline for further development of the Almazov Centre. All eight priority areas of the project are directly related to its day-to-day work. These include the provision of primary medical care, prevention and control of cardiovascular diseases and cancer, children’s health care, training of medical personnel, use of IT. 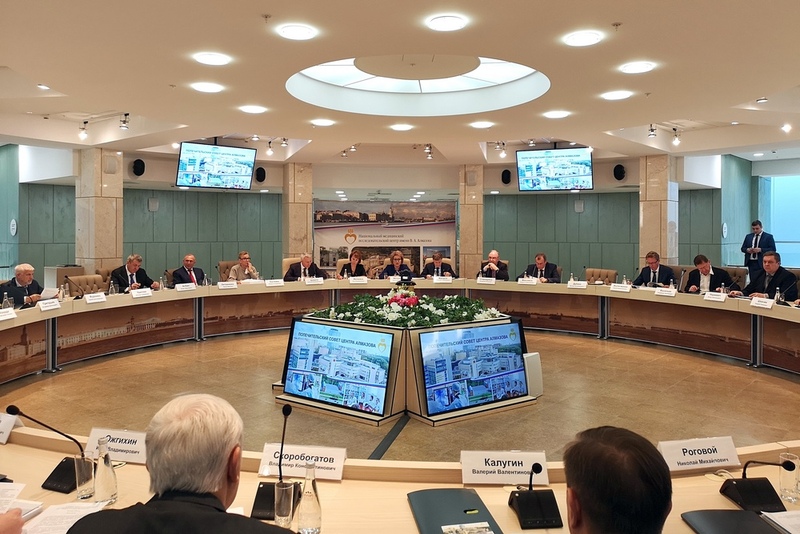 Prof. Evgeny Shlyakhto, Director General of the Almazov Centre, gave a presentation on the Centre’s participation in the implementation of the Health and Science projects in terms of their close interconnection. In particular, there are a number of prerequisites for creating the Research and Educational Centre to be focused on breakthrough biomedical research and educational technologies. Since 2015, the Almazov Centre has been the anchor institution of the Translational Medicine cluster that has united the leading universities and research institutions of St. Petersburg. “The accumulated positive experience of their interaction within the cluster will contribute to their effective and fruitful work in the format of Research and Educational Centre in the priority area of scientific and technological development related to personalized medicine and high-tech healthcare,” highlighted Evgeny Shlyakhto. According to the Government Decree, funding for the design and construction of Research and Educational facility has been provided in the federal budget. The construction of the facility with an area of 40,000 m2 has been planned as part of the Federal Targeted Investment Program for 2018 and for the planned period of 2019–2029. On 15 October 2018, the Almazov Centre launched the closed international competition for the development of the design concept for the project. At the meeting of the Board of Trustees, Denis Leontiev, Director General of the Strelka Design Office, presented the concept with implementation timeline from 2018 to 2024. The meeting also stated the need to create on the basis of national medical research centres and, in particular, the Almazov Centre, reference centres for epidemiological studies — epidemiological monitoring centres. This is due to the important role of national medical research centres in the implementation of the Health national project in the following aspects: they must constantly monitor the current situation with morbidity, mortality and the provision of specialized care in respective fields; apply a single patient routing system with the use of telemedicine technologies; promptly introduce innovative methods of treatment and diagnosis based on research results; constantly improve the qualifications of doctors; create a system of internal and external quality control based on clinical guidelines and treatment protocols. The Board of Trustees resolved to approve the strategy for the development of research, educational and clinical activities of the Almazov Centre for 2019–2024 and recognize the implementation of the research and education integration concept as part of Science and Health national projects as a priority strategic goal. The following initiatives were supported within the framework of the Health project: creating the Reference Centre for Epidemiological Studies — epidemiological monitoring centre; creating and implementing a new model of care based on the principles of value-based and patient-oriented medicine implying the development of a quality management system using digital technologies. Also, a request to create a Nuclear Medicine Centre at the Almazov Centre will be sent to the Russian Ministry of Health. 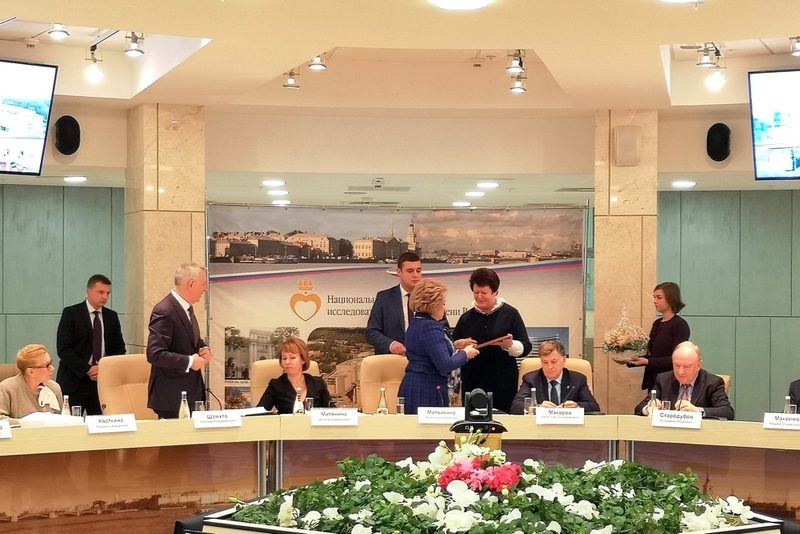 – Valentina Matvienko, Chairwoman of the Federation Council, received the Gift of Life award and a commemorative token for a personal contribution to the noble cause of helping people with rare diseases on behalf of patients from all around the country united by the Centre for Patients’ Care “Genom”. 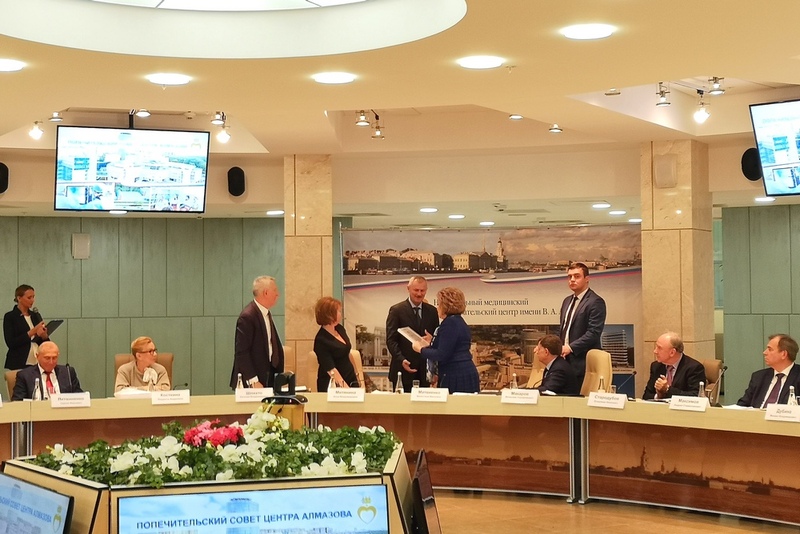 – Nikolay Tsed, head of Primorsky district administration received a Letter of Acknowledgement from the Chairwoman of the Federation Council for many years of dedicated work and great contribution to the social and economic development of the Primorsky district of St. Petersburg.